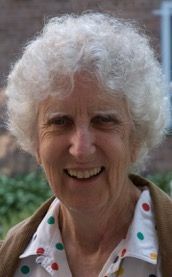 Sister Sheila Murphy, OSU, a beloved member of the Ursuline Community, died peacefully on December 5, 2018 at Andrus –on-Hudson, Hastings, NY. Born in Flushing, NY, in 1931, she was the daughter of Martha Fairbrother and George Murphy. Predeceased by her parents, Sr. Sheila is survived by her loving Ursuline Community, cousins and friends. After graduating from the College of New Rochelle in 1953, Sister Sheila entered the Ursuline Order in Beacon, NY and professed her vows in January 1956. Known as Mother Martha, she earned a Master of Fine Arts degree from the Catholic University of America. A gifted and creative educator, Sr. Sheila’s ministry in education included serving as a teacher or principal in the Bronx at Our Lady of Mercy, St Philip Neri, St. Jerome, Ursuline Academy Lower School in Bethesda, MD, and at All Souls Catholic School in Sanford, FL. In addition, her passion for the integrity of the earth and social justice inspired her to serve on the Social Services Board in the Diocese of Orlando, Fl. She also spent a year teaching English as a Second Language in Thailand. Over the years, Sr. Sheila served the Ursuline Community in many capacities: Superior of the Bedford Park Convent, Provincial Councilor, and Board member for the Academy of Mount St. Ursula, as well as, the MSU Speech Center. Before her move to New Rochelle in 2016, Sr. Sheila served in Malone, NY for more than a decade as a volunteer in a variety of ministries. She was involved in Notre Dame Parish, the Ursuline Associates, and the Council of Religious, Social Justice Committee for the Diocese of Ogdensburg. Visitation will be Dec. 7th from 3:00-5:00pm at the Ursuline Province Center ,1338 North Ave New Rochelle, NY 10804. There will be a prayer service at 4:00pm. Mass of Christian burial will be celebrated Dec 8th at 11:30 am. Burial will be at Gate of Heaven Cemetery. Donations in Sr. Sheila’s name may be made to the Ursuline Sisters Retirement Fund at the North Ave address.